When the managing editor of Gulf News asked me to cover the papal visit a little more than a month ago, my jaw dropped. I could not speak for a few minutes because many thoughts ran through my mind. Am I the right person? Would I do a good job? Am I adequately qualified to travel with the pope? I did not get time to react. "This is a once-in-a-lifetime experience," he said. When I got out of my editor's cabin, the blood had drained out of my face. A colleague asked if I was okay. He thought something had gone terribly wrong. Since that day, I have thought about the trip every single day. 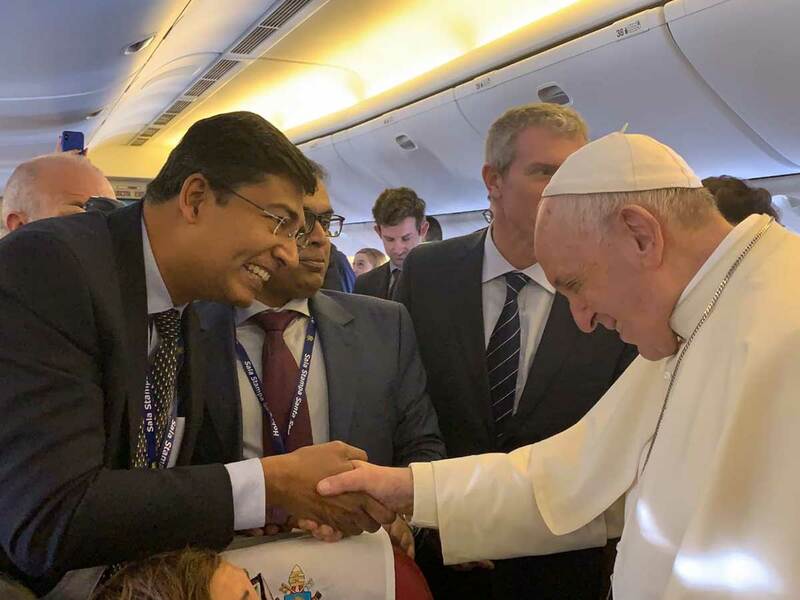 After all, it is not every day that you get an opportunity to travel with the pope. I was told that the team from the UAE would have to go to Rome, travel to Abu Dhabi with the papal team, go back to Rome and then return. It seemed like many trips in five days' time. I shared the news at home with my wife and son, my parents and in-laws, but kept it away from many others because I was not sure if plans would change. Eventually, most of my friends came to know about it. "It is a privilege," said some. "It is a blessing," said others. All agreed that it was a unique opportunity. But for me I only wanted to do my job. I knew the newspaper was relying on me. Over the past couple of weeks, the Editor-in-Chief would regularly ask me about the trip. It added to my anxiety. I had heard and read about Pope Francis being a simple and humble man, how he cared for those who did not have, how we should give from our hearts and about how we should break down barriers with love. But nothing prepared me for what happened on the flight back from Rome. From the time we boarded the other journalists were very excited. The cameramen were given seats by the window so they could set up their cameras. Someone said the pope would come to the back of the plane and meet the media team about half an hour after take-off. We waited. And then it happened. I saw humility walk towards me. The man in a simple white cassock spoke a few words in Italian and then began walking down the aisle. He shook hands with every single journalist, pausing, listening to them, looking into their eyes, nodding gently. Then he moved on to the next person. When my turn came I said a few words. He looked at me, still clasping my hand, smiled and nodded. He went down the aisle, through the back of the Alitalia B777 and then walked up the other aisle, doing exactly the same thing. After the Pope went back to the front of the plane, there was a scramble to find out who took our pictures. We needed them for posterity. I asked around and one colleague said he had good pictures of me. "Can I airdrop them to you," he asked. Of course, he could. I shared the photos with my wife, family and a few friends. It has gone all over the place and friends have been calling and messaging about this unique privilege. Even now, the gravity of that moment is just sinking in. I understand that as my boss said: This is a one-in-a-lifetime experience. I am happy and humbled to have had this experience. This morning when I saw Pope Francis arrive at the Presidential Palace in a Kia Soul, I said to myself: "Thank you God for giving me the unique privilege to be with this man of God."